Colorado is in the Rocky Mountains region of the United States. It is a beautiful state with impressive mountain peaks, excellent winter sports, and top rated restaurants. Many visitors come to Colorado specifically for the ski resorts, but even if you visit during the summer months you're sure to enjoy the state's impressive natural beauty. Denver is the capital and largest city in Colorado. It's known as "the Mile-High City" and is a fun and lively place to visit. Breckenridge is a popular ski resort at the northern tip of the south central region of Colorado. It's a beautiful and fun area with no shortage of activities for visitors. Aspen is another favorite ski resort in Colorado. It has one of the most recognizable names in the area and it remains a favorite place to visit. Colorado, and in particular ski resorts, are expensive travel destinations. There are a few hostels in the area that offer more reasonably priced accommodation. If you're looking for a fun environment at an affordable cost, then a hostel might be your best bet. A good hostel in Denver, Colorado for solo travellers, backpackers, and small groups. Hostel Fish is one of the best hostels in Denver, Colorado. It's run by backpackers, for backpackers and it's a fun and friendly place to stay while you're in the city. Because the owners are travelers themselves, they know just what you're looking for. There are many great amenities at this hostel including an outdoor terrace and a shared kitchen where guests can hang out and socialize. The hostel also organizes all kinds of fun events for guests including pub crawls and evening activities. The hostel has a wide variety of dorms available for every budget and travel style. There are four, five, six, seven, eight, nine, and ten bed dorms. There are also female only and co-ed rooms available. This is a fun and welcoming place to stay in a convenient location in Denver, Colorado. 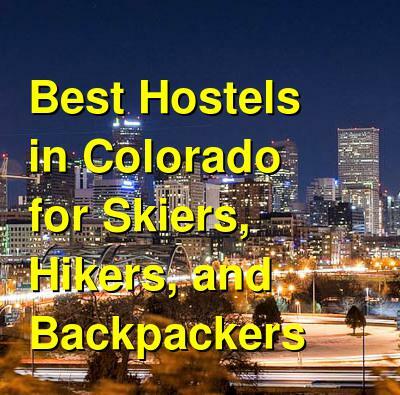 A good hostel in Breckenridge for skiers, snowboards, backpackers, and solo travellers. The Fireside Inn in Breckenridge is just two blocks from the historic Breckenridge Main Street. It's a convenient place to base yourself if you want to enjoy hiking, biking, skiing, or snowboarding in the Colorado Rockies. It's also just a short walk from the town's best restaurants, bars, and shops and you can walk or take a free shuttle to BreckConnect Gondola or Peak 9. The hostel has a very cozy and homey atmosphere. There's a hot tub where you can relax and there are secure places where you can store your bicycle or ski equipment. The hostel also has a microwave, refrigerator, and television that guests can use. And you can start your day off right with the complimentary breakfast of pancakes, French toast, oatmeal, and eggs every morning. This hostel has private twin rooms and basic four bed dorms available. A good hostel in Breckenridge for solo travellers, backpackers, hikers, and small groups of friends. The Bivvi is another option in Breckenridge. It's a boutique style mountain lodge that has ten bedrooms to choose from and the dorm rooms sleep either four or six people. The hostel is within walking distance of downtown Breckenridge and it offers impressive views of the Tenmile Mountain Range. There's an outdoor fire pit and hot tub that guests can use, and there's a cozy and relaxing environment. Every morning guests can enjoy a complimentary breakfast that includes either scrambled eggs, french toast, or pancakes. Fresh fruit, granola, yogurt, and coffee are also available with the breakfast. The hostel has a nice common area where you can relax with other guests. Every day after 4 pm they serve Colorado Micro Brews as well as a selection of wines. The movie lounge is also a nice place to relax and watch a movie or hang out with friends after a day exploring the mountains. A good hostel in Aspen, Colorado for budget travellers. St Moritz Lodge is a boutique style lodge in Aspen, Colorado. It is an affordable and comfortable place to stay with both shared and private rooms to choose from. The private rooms have twin beds and the dorms sleep just four people and are split by gender. The hostel is located on the quiet West End of town. Its just a short walk from the business section and is very close to bus stops that serve all of the local ski areas. The hostel includes a free continental breakfast during the peak summer and winter months. There's also a heated pool with whirlpool jets, a steam room, a barbecue area, laundry facilities, internet access, and off street parking available. This is one of the best value options in Aspen. It's a comfortable and reliable place to stay if you want to enjoy the town but don't want to break the bank.